We all Know Gaffers Tape, But What is a Gaffer? 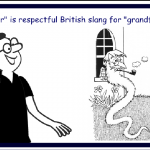 Gaffer is British slang for “grandfather” and is meant as a term of respect. In the early days of the movie industry, the lighting equipment was often huge and extremely heavy. The only people experienced in moving that kind of stuff around were longshoremen – the dock workers who load cargo onto ships. These guys were unionized and worked in highly structured teams. At the top was the older and more experienced “grandfather” or – Gaffer. Of course, that meant his most experienced apprentice was – can you guess? – his Best Boy. Thetapeworks.com offers a more detailed history of the gaffer, and how the position has evolved in today’s production industry.